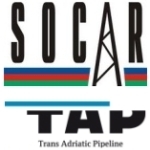 édité le 30/07/2013 - Plus de news de "Socar" - Voir la fiche entreprise de "Socar"
On July 30, State Oil Company of Azerbaijan Republic (SOCAR) and current shareholders of TAP AG have signed a share purchase agreement in Zurich to ensure SOCAR’s participation in Trans-Adriatic Pipeline project. SOCAR, PEG, AXPO, BP, Fluxys, Total and Statoil have also signed TAP AG new shareholder agreement. TAP will transport natural gas from the Shah Deniz II gas-condensate field in Azerbaijan to the markets in Europe. The pipeline will cross Greece and Albania and the Adriatic Sea, before coming ashore in Southern Italy. TAP will open up Southern Gas Corridor connecting Azerbaijan and other gas producers in the Caspian Sea with Europe and enhancing Europe’s energy security by providing a new source of gas.